Find us in the Frozen Veggie aisle at Walmart! Pop & Cook brings to you our signature line of pre-portioned fresh garlic and herbs. First, we start by growing our own garlic, basil, cilantro and ginger. At peak freshness, we pull our products from the fields, process and flash freeze into our convenient trays within 90 minutes of harvest. 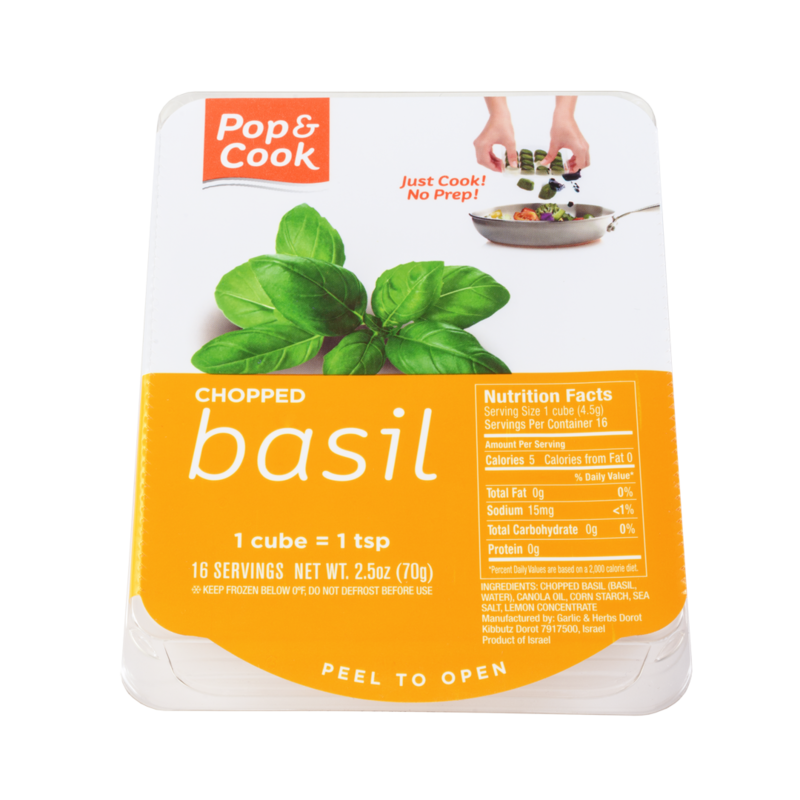 Pop & Cook pre-portioned garlic, onions and herbs eliminate chopping and measuring, making it effortless to season and flavor your cooking. How would you enjoy the best pasta in no time? In a pan, mix half a cup olive oil with 2 garlic cubes, 2 basil cubes, 1 parsley cube, salt and pepper – pour on cooked pasta and… enjoy! Basil – is its taste better than its beauty, or vice versa? No one can decide… But one thing is definite: in your garden it can spread and become a big and impressive bush with small purple flowers and an amazing aroma. And in the kitchen – basil is simply the king of herbs! You can add it to almost anything you’re cooking: soups, fish, casseroles, pasta and even excellent basil ice cream! First and foremost, of course, pesto sauce! Anything that goes into the oven – chicken, meat, fish, or vegetables – has a lot to gain from some basil. A cup of tea with basil after a big meal will help the digestion process. Same cup at the end of a stressful day will help you wind down and relax. An extract of basil with ginger and honey will ease the respiratory system’s function.